“Carentan” is one of the weaker installments of Band Of Brothers, if not the weakest outright. It’s the kind of episode that’s interesting in theory but not really in practice, as it attempts to build an entire story around a concept—sometimes, men are petrified by combat—instead of really telling a story. And then just when it seems like it might have found a way to tell that story, it instead cuts away to something else entirely, and we spend even more time on stuff that had nothing to do with what just preceded, before a graceful final scene that somehow ties everything together, but only barely. It’s not the most well-structured episode of the series, and it doesn’t help that it’s built around a character who’s more cipher than man. Oh, and it also doesn’t help that it’s based on what’s basically an untruth, if not a lie. There’s not really much that could have been done about this. When Stephen Ambrose was researching Band Of Brothers the book, he heard from some of the men of Easy Company that Albert Blithe had died in 1948, having never really fully recovered from the wounds he sustained at Carentan (including a bullet in the neck). He put that in his book—which apparently only mentions Blithe a handful of times—and then the book was immortalized as this miniseries (which expands those handful of mentions into a full, episode-long character arc). At no point in this process did anybody—Ambrose, or his editor, or somebody at HBO—think that maybe someone should check if this account of Blithe’s life was accurate. Because the truth of the matter is that Blithe didn’t die in 1948. In fact, he outlived World War II by a couple of decades and stayed in the Army for the rest of his life. He even fought in the Korean War and died an active service member in Germany in 1967. The cause of death? A perforated ulcer that developed into peritonitis and renal failure. Not quite what’s depicted here. The most potent answer for why the show follows Blithe in this episode is that he really was the guy who was scared, really was the guy who overcame his fears but briefly, before getting shot by the bullet that would take his life a few years later. But because that’s not what happened, the show loses that particular argument. Had Blithe’s story been handed to some other composite character who could be dropped into the previous two episodes and given more prominence to build to this point in better fashion, the episode might have gained power from its ultimate destination. Instead, we’re stuck with a character who never pops off the screen, played by an actor who isn’t given a lot of material to work with, handled via a character arc the episode loses interest in with 10 minutes left. Blithe is taken to the hospital, where other men are celebrating their wounds, and we’re meant to see him as a casualty about to happen. But instead of ending there (which at least would have had thematic symmetry with the opening shot of Blithe staring into the sky mirroring nicely the shot of the heavily wounded Blithe staring at the hospital ceiling), we get several more scenes of motorcycle tomfoolery and the characters learning they’re headed back to the front after a brief stay in England. Malarkey picking up the laundry and learning how many dead and wounded men have packages left behind at the launderer is a powerful scene, but it feels like it loses something for coming at the end of an epilogue that doesn’t hang with what came before. 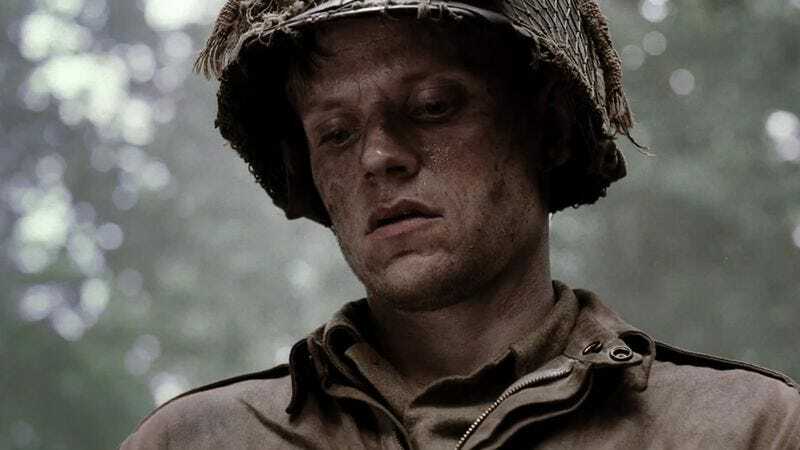 In general, Band Of Brothers is better the more it focuses on singular characters in the midst of battle, but that doesn’t really carry through in “Carentan.” The truth of the matter is that some of the men who become fearless, as Speirs describes, will die, just as some of the men who never overcome that fear will die. It’s all terrible and random, and I like that “Carentan” chooses to portray Blithe as someone who never turns off his mercy or remorse, someone who will go and find the man he felled and have a quiet moment with his corpse. It just feels like it would have paid off more if we were watching someone with an actual character behind them, rather than a figure shipped in to prove some sort of point. And it would help even more if that character weren’t based on a man whose life ultimately ended up undercutting the episode’s central argument. Women and children alert: We get two glimpses of the aforementioned in this episode, first when the men burst into that home in Carentan and see the mother, two children, and grandfather huddled on the floor, then when we see the laundress and her assistant (also female) whom Malarkey picks up the laundry from. The first group cowers in terror; the laundress has an easy rapport with the new Sergeant. These are fairly common roles for women to pop up in in these sorts of stories, but I can’t help but think of those people huddled on the floor every time the men fire bullets into houses that they don’t yet know house enemy forces or not. I mentioned above that the battles in this episode are pretty impressive, and a big reason for that is that the second one features a fair amount of tank warfare. You can never go wrong with tank warfare. We get a nice little moment where Harry reveals that he’s hanging onto his reserve parachute so that his fiancée might make a wedding dress out of it, what with the rationing of fabric and all. I really love the little glimpses we get of the men’s lives back home in this series. I think there should be a DVD extra in every war movie where you can have Damian Lewis down in the bottom corner of the screen, just giving intricate hand gestures meant to indicate the plan of attack. He always looks so purposeful and intense while doing it. I like how as the men are in the field longer and longer, commanding officers and higher-ups are more tolerant of humor at the expense of the Army or the whole experience, as when Luz mocks the idea that Easy Company would be done after three good days of fighting. Also good: the sad little “see what I mean?” when fighting erupts just after complaints about how Easy is always the company sent into danger first. “Carentan” was written for television by E. Max Frye and directed by Mikael Salomon. Though this is not the series’ finest hour, both have their moments. Frye’s script contains that great scene between Speirs and Blithe, for instance, and Salomon turns most of the nighttime scenes in this episode into beautiful nightmares, pauses between the slaughter.